Gaining buy-in from others to go in the direction that has been established is not a mystical formula. Gaining buy-in is not forcing or threatening someone to “be on board or else!” Gaining buy-in is not manipulating or tricking someone into doing something. Gaining buy-in is not even motivating someone to do something. Gaining buy-in is simply creating an environment where people motivate themselves because they see something for themselves in achieving the goal. Gaining buy-in starts with understanding the members of your team. Each team member is motivated to achieve organizational goals by different things. If the goal of the team is to achieve “X”, in order to have buy-in from all team members you need to clearly understand what they get from achieving “X.” When you know what motivates each team member, you can then create communications that resonate at the individual level for each team member. Your first reaction may be to say: “I don’t have time to do that for each member of my team!” Well, yes you do. 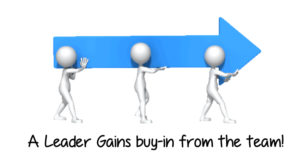 Gaining buy-in is not a long drawn out process. In fact, it is easily created in a conversation at the group or individual level. I started with the premise that you need to understand your team members. How well do you understand your team? Of course everyone comes to work to take care of the basic needs that earning an income provides. Consider that any member of your team could be earning a living by doing almost any kind of work. Yet, they have chosen to work with your team. Do you know why? What is it that each team member gets for themselves, above earning a living, that has them working for your organization? When you can answer these questions, you can then begin to understand what is driving each team member to be successful. Let’s look at an example. Let’s say that you have a goal to improve operational efficiency by 25% this year. Some members on your team will want to achieve this goal because they are motivated to help people. When operational efficiency is improved by 25% there will be less stress on people and they will have a better work life balance. Some team members will want to achieve the operational efficiency goal because the improved efficiency means a higher year-end bonus. While others will want to achieve the goal because it provides an opportunity to learn and apply knowledge. Notice one goal; many reasons to attain the goal. Dwight Eisenhower said: “A leader is someone who gets someone to do something because they want to do it.” When you understand what each team member gets for themselves when the goal is achieved, and you communicate with them in language that resonates with that motivation, you are well on your way to gaining buy-in and achieving the desired results.